The Great God is Shiwa, whose matted hair catches and conducts the descent of the river of life in its passage from heaven to earth. Also to be found in the hair of Shiwa, adorning his brow like a diadem, is the crescent moon. This represents the cup of offering which brings about all manifestation and the passage of time in which each manifestation occurs. THE name of the little Indian fable, here presented to the lover of curiosities in an English dress, is ambiguous. We may translate it indifferently, either: The new moon in the hair of the God of Gods: or else: She that reduces the bride of Gods, demons, and all the rest of creation; that is, the Goddess of Beauty and Fortune. 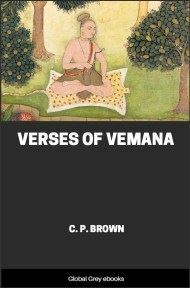 To those unfamiliar with the peculiar genius of the Sanskrit language, it might seem singular, that two such different ideas should be expressible by the one and the same word. But it is just in this power of dexterous ambiguity that the beauty of that language lies. As there are butterflies’ and beetles’ wings, of which we find it impossible to say, that they are positively this colour or that—for according to the light in which we view them they change and turn, now dusky red, now peacock-blue, now it may be dark purple or old gold—so a well formed Sanskrit compound word will subtly shoot and coruscate with meaning, as do those wondrous wings with colour: and this studied double, treble, manifold signification of its words lends to the classic tongue a sort of verbal sheen, a perpetual undercurrent of indirect suggestion, a by-play of allusion, a prismatic beauty, of which no other language can convey the least idea. For translation must split up what in the original is a unity . And so, our title, according to the value which we choose to assign to its component elements, can be taken to denote, either the hair-jewel of the moon-crested god, or the universal pre-eminence of world-wildering Aphrodite. And at the risk of incurring the charge of mysticism, I would venture the opinion that our author, in wavering thus between two meanings, two notions at first sight utterly distinct and different, has instinctively seized a subtle analogy, difficult to analyse, and more obvious perhaps in the clear and silent Indian atmosphere than in our own thick and foggy clime: one, however, to which all ancient mythologies bear witness, by invariably connecting their Great Goddesses with the Moon. Night after night, when the fierce fury of the merciless intolerable Indian sun has spent its energy—there are days in the hot weather, when the very last ray from his disappearing rim seems to bore like a red-hot nail into your skull and drain away your life like a great blood leech—when at last the enemy has gone, and the blue mild lustrous Dark with its healing, soothing, balmy peace has fallen over the fainting world, I have watched the inexhaustible Beauty of the Moon: and then it is, that there seems as it were to glide into the soul, like a nurse into a sick room, some thing, some presence, vast, infinite, and feminine. The pale and shadowy Holda passes over the dusky dome, with the stars in her violet hair, or is it rather the Blessed Virgin, the ancient hornèd Isis, stretching colossal over the blue, with the Moon beneath her feet? Mere fancy, says the reader: and yet I do not know. Something there seems to be in common, something that all the ancient nations felt, between the beauty of an eastern night with the Moon in its forehead, and the strange consolatory cosmic magnetism that Woman and her mystic Beauty exert over her everlasting patient, Man. Take away her sympathy, and his life would resemble nothing so much as the thirsty earth, parching under an Indian Noon, for ever without a Night. For the proper comprehension of this story, the English reader ought to know, that just as its keynote—husband is a good wife's god—is the very core of Hindoo manners, so the type and model of all devoted wives, the Satí, or Constant Wife, par excellence, is Párwatí, the wife of the moon-crested God. He and she together are the symbol of wedded harmony, so close and indissoluble, that they are regarded, under one aspect, as having but a single body between them, which they share: he is the god, whose other, or left half, is his wife: and poets compare their relation to that obtaining between a word and its meaning. They are the incarnation of bi-sexual unity, Hermaphroditus, the ideal type of sacred indissoluble marriage. In India, marriage is still something more and deeper than a contract, and has not therefore yet become ridiculous. In India, the gods are not yet pallid spectral ghosts, rationalistic residua of neuter gender, but the immortal lovers of their wives; and conjugal affection is what it ought to be, typified in heaven, the highest pleasure even of the gods. They carry their wives about in their arms, sit them on their knee, and are inseparable from them. And in return, their wives are their devoted slaves. Who, says the Hindoo proverb, is the best-loved woman? She that adores her husband as a god.